The Luxury brand of Ford, Lincoln, is up with its new Lincoln Continental concept car 2015. The model enthralled the recent New York motor show and will soon be rolling down the streets, as mentioned by the CEO. If this happens, luxury over wheels will definitely get new heights and yes it isn’t just due to the eyeball capturing exterior of Lincoln continental concept nor is the luxuriously comfortable interior of Continental concept car 2015 but it is the unmatched amalgamation of, speed, class and comfort.With the launch, the Continental Concept has been called a copycat of the Flying spur by Bentley's chief designer Luc Donckerwolke. Well, we don't really think so and would like to leave the matter in your hand for that.So what now holds the anxiety with in, get rolling with this new style statement and be prepared to touch the 250 KMPH sting with comfort, like on any recliner enjoying champagne kept by your side. This isn’t a joke this is just the sight of what this piece of invention holds. The Ford’s up market brand Lincoln has made back the entry with its new concept car at the 2015 New York motor show. The concept has been tagged with, Lincoln Continental and is expected to hit the markets somewhere in 2016. Though not much has been talked in terms of the specifications of this luxurious brand’s comeback vehicle but let us have a look at what’s been revealed. We understand that the tech specs so mentioned are too less to handle the anxiety for the Lincoln Continental Concept complete specifications but this in all is what the company shared. Though we do have a detailed overview of interior and the Drive train, but before we move here is a look at the company’s other offerings. The journey started back in the year 1940 as a two-door coupe but further out of the blues the nameplate went discontinued in around 1948. Moving with the tickles it got revived and came as a separate marquee, though the expensive price tag and the unprecedented luxury in no time made it competitor of Rolls Royce. Till date the journey, perhaps with mighty competitors had been a little rough and looking upon same, with the 13 year back hardship of one more concept car that never came, we cannot be sure about this one, at least till the production model arrives. Indeed till then we have a great 2015 concept car by Lincoln to talk upon. 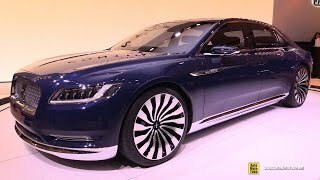 Let us get ourselves little close in to the Lincoln continental concept car 2015 features. The interior of Lincoln continental concept car is flawless, classy and comfortable. The 30 way adjustable seats with the passenger’s side rear seat, easily converted into a recliner. It is also equipped with an SPG smart Glass tinting sunroof which can cool the interior by as much as 19 degree Fahrenheit and exceptionally blocking 99% UV rays. A tablet supporting lap tray, a champagne compartment and more of orientations defining the gleam of luxury as per the today’s century are part of the interior of Lincoln continental concept car 2015. 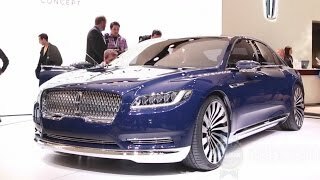 The exterior of Lincoln Continental Concept car 2015 gives you the true glimpse of style and striking elegance. With a slight change in the split grille, this time Lincoln gave the front more promising look with the repeating polished aluminum Lincoln star emblems. The headlights stand equally matching the standards with five smaller units each and a hockey shaped LED pattern adding more of stars to its unique light pattern. Around back a sleek full length tail light accompanied with the brand’s name Lincoln littering on the trunk lid. 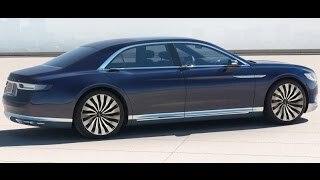 The tail pipes are equally as broad as the tail lights and the narrowing look to an extent matches to its lineup MKZ, but in all the exterior of Lincoln continental concept car looks promising and luxurious. As per the reports the unit is expectedly working upon the 10 speed auto transmission. 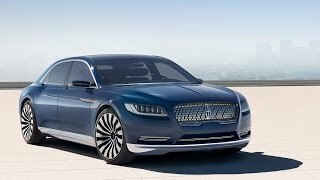 The Drive control of Lincoln Continental 2015 Concept car offers three driving modes, normal, sport and comfort and for rest as mentioned earlier the 3.0 liter v6 Ecoboost is all expected to join the car in its production cycle. This was all what till today the company shared under the tag of Lincoln continental concept car 2015. Now what is to be seen is, that how far this model’s production diva manages to cope with its competitors Cadillac CT6 and Mercedes Benz S Class. We at our end believe that the arrival of this concept is a good sign and expect the production model to hit motor shows soon.